Last week, Morningstar named the best 529 college savings plans for 2018. College savings plans are without doubt the best vehicle to save for education. These plans allow investors to skip federal taxes on investment growth to pay for college and its associated costs. For many investors, that means they can avoid a 15% or 20% long-term capital-gains tax on distributions, depending on their tax bracket, to pay for education costs such as tuition, textbooks, and housing. Additionally, around half the U.S. population lives in a state that offers more tax savings at the local level. The capital-gains tax incentive meaningfully increases the odds of beating the college tuition inflation monster. Keeping up with tuition inflation is an important consideration, particularly given how painful it can be. Over the past 10 years, college tuition inflation has averaged 4.2% a year. That’s roughly 2.5 percentage points above general inflation, as measured by the Consumer Price Index. 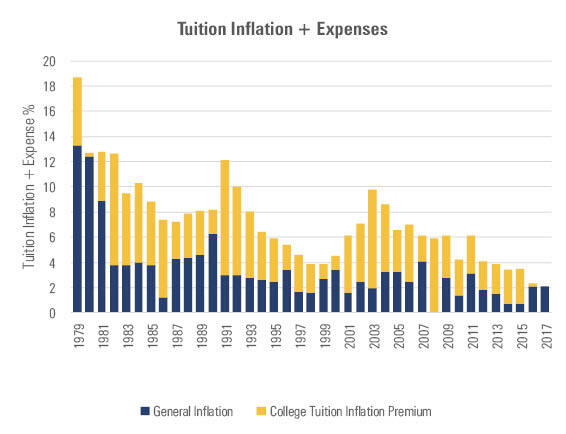 Since 1979, tuition inflation outpaced general inflation by an average of 3.8 percentage points, so at least it’s slowed down in recent years. In fact, for the first time since 1979, tuition inflation roughly matched general inflation in 2016 and 2017. While differing views exist, many researchers expect tuition inflation to remain elevated versus broad inflation. Plus, the tuition inflation premium tends to surge in waves, so it may be due for a comeback. The most popular investment choices in college savings plans are age-based portfolios. These portfolios are similar to target-date retirement funds. They start out more aggressive with higher equity allocations and gradually lower risk by increasing their fixed-income allocations as the beneficiary approaches college. The industry average glide path starts at 82% equity when the beneficiary is born and declines to 11% equity at college age. Because equities are higher when the beneficiary is younger, saving earlier improves your odds of beating tuition inflation. 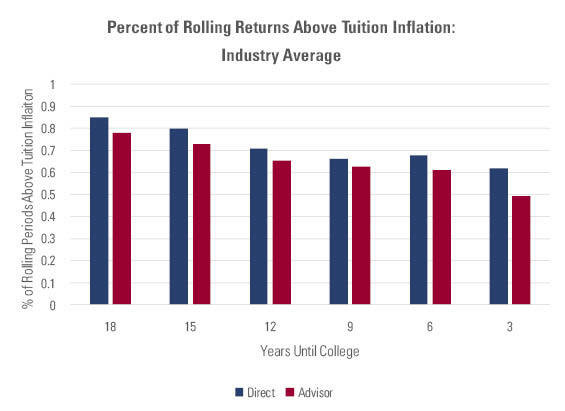 To determine how much investors would have improved their odds of beating tuition inflation by starting early, we looked at historical rolling returns of a portfolio that matched the industry’s average glide path over several different time periods. At each step, the equity exposure was 80% S&P 500 and 20% MSCI EAFE, and the bond portion was the Bloomberg Barclays U.S. Aggregate Bond Index. Contributions were excluded to isolate the performance of the age-based plans versus college tuition inflation. We also adjusted the returns for the median fees charged by direct-sold plans, which cater to do-it-yourself investors, and advisor-sold plans, which are sold through financial advisors. In 2018, the median fees for direct-sold and advisor-sold age-based portfolios were 0.30% and 0.95%, respectively. The latter charge higher fees because they skew more toward active underlying funds and levy 12b-1 fees, whereas direct-sold plans tend to favor lower-cost passive strategies. Exhibit 2 shows the percent of time each rolling period would have outpaced college tuition inflation from 1979 through September 2018. As shown above, the later an investor starts saving, the worse the chances of beating tuition inflation. 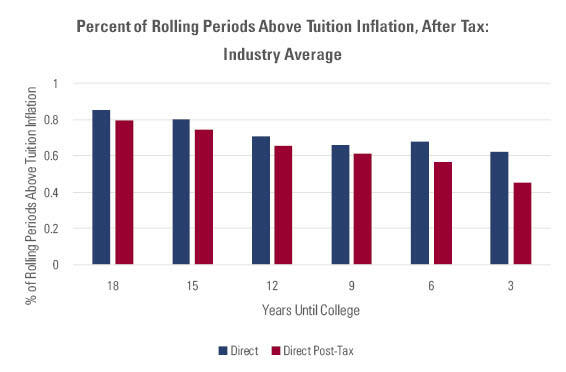 Over rolling 18-year periods from 1979 to September 2018, the median direct-sold and advisor-sold plan would have beat tuition inflation 85% and 78% of the time, respectively. Starting just three years later would have lowered the odds of beating tuition inflation to 80% and 73%, respectively. Those who wait until the child turns nine see their odds fall to 66% and 62%. The higher fees for advisor-sold plans lowered their odds of coming out ahead. This doesn’t take into account that advisor-sold plans hold more active funds, which could lead to better or worse outcomes depending on the ability of the managers to beat their respective indexes over the long term. As we touched on previously, tax benefits go a long way toward helping college savers keep up. Exhibit 3 shows how the success rates for the average direct-sold plan would have changed if savers were subject to a 15% capital-gains tax upon withdrawal. The success rate over 18 years drops to 77% after taxes from 86%. Over three years, the success rate drops to 40% from 66%. College tuition inflation represents a significant hurdle that college savers should aim to at least match to maintain the purchasing power of their savings. Many variables that affect this outcome, like market returns and inflation trends, are outside of investors’ control. However, by starting early and choosing plans with low fees, investors can improve their odds of beating tuition inflation.